Kroeus Spinner Hardshell Suitcase is offered in three sizes- 20, 24, 26 and 29 inches and not as part of a set. The lightweight yet robust exterior is made of the sturdy plastic ABS material and Polycarbonate- PC to be able to be protected from the impact at the airport or outside. It also has a metallic brushed finish that gives it that premium look and makes it heaps more solid and durable. Each bag comes with a TSA lock with a 3-digit security code for extra security and there will be no need for breaking the lock to check the contents of your bag. It will help keep your clothes and other stuff safe and you shall be able to go through the passport and security check quickly. Kroeus Suitcase first appeared at Amazon.com on in May 2018 and scores 4.7/5 stars by six customers at the time of this review page. Whichever size you choose this is not a cheap suitcase but you seem to be getting more than what you pay for. You’ll find a protective film when you first get it shipped to your address and you might want to peel it off before starting to use it. The 360-degree rotating multi-directional universal spinner wheels glide very smoothly, quietly and effortlessly. 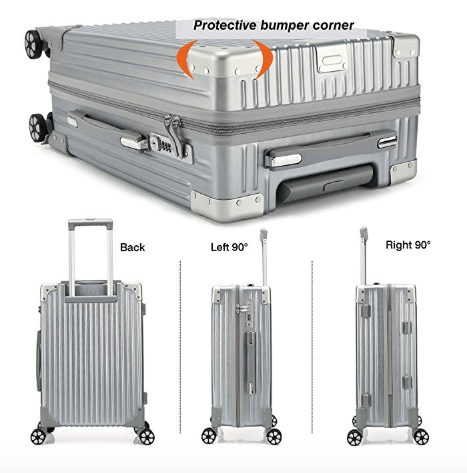 You’ll also find that the corners are strengthened with rivets and this will protect your suitcase better (protective bumper corners). The telescoping handle on each bag can be adjusted to three levels, which is good for people of different heights to move the suitcase easily even in tight spaces. The ABS solid plastic and polycarbonate material help the suitcase be solid, lightweight and not easy to be scratched. There are solid compact handles on the side and at the top of each suitcase that offer you a bit of flexibility and comfort. The blue interior is fully lined and includes elastic cross straps for extra support for your clothes, a removable plate for better organization and breathable mesh pockets. And you have plenty of space inside and it is nice to have different compartments. You’ll find a pocket on each side of each suitcase for your water bottles. You can purchase it in black- 8205 or dark grey- 8219 colors, depending on what you like or prefer. 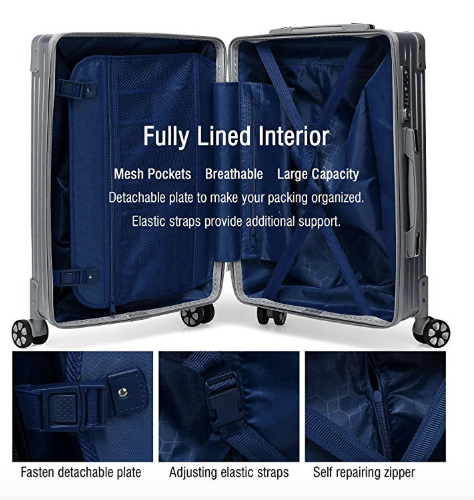 The 20” cabin bag measures 22.8 x 15.4 x 8.3 inches, 24” suitcase measures 26.8 x 17.3 x 9.3 inches, the 26” suitcase is 291 x 18.1 x 9.8 inches and the largest 29” measures 31.1 x 19.3 x 11 inches. You can choose the one that will meet your needs- enough packing space for the duration of your trips. Kroeus suitcases are designed to hold up- prove durable for many years of frequent use.